Remembering Chris Lighty, Hip-Hop Leader And My Friend : The Record As a teenager he carried records for DJs. As a professional, he carried water for an industry and for a culture. 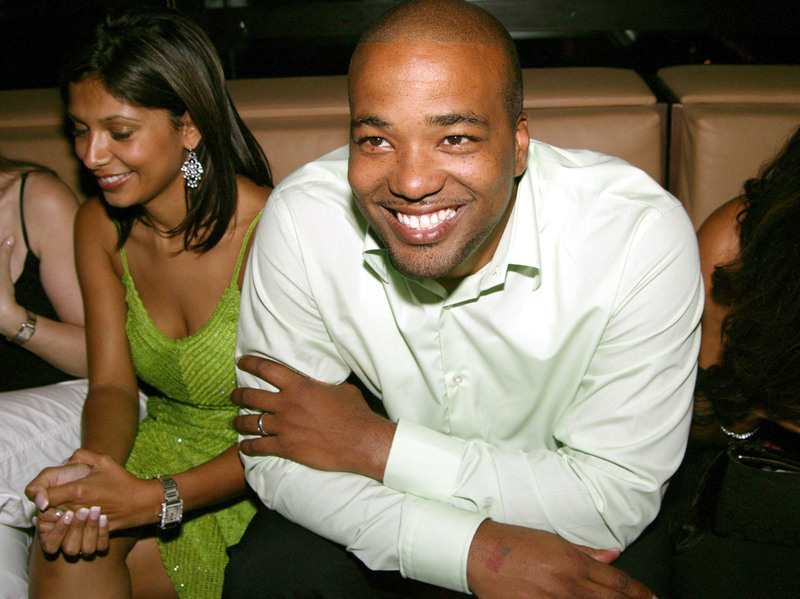 Chris Lighty with party guests in 2004. For those of us who remember when it was near, or actually, impossible to get hip-hop booked into nightclubs and arenas, who remember when pop radio stations would not play rap, who remember that pitching a rap act to a mainstream publication or late-night TV show was like pushing a boulder up a hill, for those of us who lobbied for and explained hip-hop — for many of us, to see LL rapping in the Gap commercial, "How easy is this?" was a thrill, it was recompense, it was, dammit, fairness. And integration. And it was not fried chicken! It was the Gap when the Gap was hot. Somebody had to make the deal go — LL was bold and unapologetic! Not a hint of pandering! It was not corny! Somebody was behind the scenes, huffing and puffing, signing papers, negotiating — lobbying. Getting paid and getting folks paid. It was Lighty's Violator. It was the kind of work that moved Lighty and his team around the globe in first class and on private jets. Chris himself moved through life with a smooth, mean grace cultivated with his siblings, the notorious Lighty Brothers, in the rust and rubble of the '70s and '80s Bronx. This during an era when crack was only wack if you were doing it (as opposed to selling it) and when hip-hop was learning to walk in the Sedgwick Avenue apartment of DJ Kool Herc. Chris Lighty has been down with hip-hop since Day One. He comes from a generation of entrepreneurs — Russell Simmons, Sean "Diddy" Combs, Shawn "Jay-Z" Carter — who dared act a part close to their actual selves in corporate America. They studied Berry Gordy and Ahmet Ertegun. They told each other tragedy-laced stories about black artists of the '30s, '40s, '50s and '60s who "died broke," or "didn't keep their publishing," or just plain old got played by a business that used and abused them. Lighty — and I know this because he's told me — wasn't having any of that. He wanted to, and did, win. He started young. There was Boogie Down Productions with Derrick "D-Nice" Jones, Kris "KRS-One" Parker and Lighty's best friend, DJ Scott "La Rock" Sterling. They were always together. But at the top of Lighty's legend is that he, known as "Baby Chris," carried crates of records for pioneering NYC DJ Red Alert. Red is related to Afrika Baby Bam and Mike G of the Jungle Brothers (they founded the Native Tongues collective and set-up the larger successes of De la Soul and A Tribe Called Quest) and soon, Lighty was road-managing the trio. He came then to the notice of Russell Simons and Lyor Cohen. He worked for Def Jam Recordings for a while. One of Lighty's biggest scores there was delivering recording artist Warren G (who would go onto multiplatinum status) to Def Jam. Lighty had to go head to head with Death Row's Suge Knight to make it happen. It can't have been a picnic. But soon after the release of BDP's Criminal Minded in 1987, La Rock was shot to death while seated in a jeep outside of the Bronx's Highbridge Projects. To many only a ghost from rap's past, La Rock remained always at the forefront of Lighty's mind. He tweeted about La Rock on the anniversary of his death—August 27. Three days later Chris Lighty — a man who smiled often but who was still wary enough that he didn't like a door at his back — was dead by his own hand, outside an apartment he kept in the Bronx. A valiant attempt at sorting the whys will be made. Those, and the wherefores, will likely never be truly known. To imagine right now Lighty's brothers and children. To imagine Mona and Lyor. Busta and Q-Tip. Mariah Carey. Red Alert. Even myself. The police say he shot himself with a 9mm. This — like any sudden death, but particularly with suicide — is a shiv to the heart. I spoke to him last when I was still editor of Billboard, around the time his company, Violator, was to merge with music publisher Primary Wave. Chris said he'd rather I interview him, that he had a lot of respect for the reporter I'd assigned. But he'd rather I write about him. We laughed about it. He pressed. I pressed back. He spoke to the reporter. I'm writing about him now. Lighty, like so many black men, was not given the luxury of being understood as a multifaceted being. He has been called, I'm sure more times than I've heard myself, a manipulative son-of-a-b----. He had a knack for getting money. He could be intense, and surly. I recall Mariah Carey speaking of him as one of the few gentlemen she knew. The ladies did love Lighty. His charm — man! — even (perhaps especially) for business meetings, he could turn it on. In a life filled with hotel lobbies, backstages and restaurants of the moment, Lighty was always reading situations. Anticipating. Strategizing. And then dinner was on him. If you were on his mental list of people whose calls he'd return, he was faithful and frank. To say that he remained streetwise even as he moved in rooms where the discussions were about the global branding of superstars, of big movies and world tours, is an understatement. The Bronx River projects die hard. People may say they're "still that same person" from the block, but Chris truly was. His Armani suit life was still ragged at the edges with wickedness. A gentleman of course — and then of course not. He was a fixer, after all, a manager of people, a crisis negotiator. And he had a habit, at least with me, of calling, when professional beefs escalated, to utilize me as a referee of sorts, a woman, who could be called upon to mediate, to do her best to convince folks to keep things civil and human. We were the kind of friends that so many of us are in and around the music business, who battled to get the music heard, make it respected, to make a living and have some power in it. There have been longish oases, but it's been, actually, a difficult road. It has hardened us as it has refined us. And now, as the whole industry creaks along toward its own transformation, the going has gotten even more tough — different reasons, but people are feeling the pain. Catastrophically, the crisis Chris could not negotiate his way through was his own. And as far as those of us on the outskirts of his life? We show up for each others' brunches and baby showers and weddings and pick-up basketball games, like the ones Chris used to have on his backyard court in New Jersey. We throw tribute concerts. We write obituaries. We show up to funerals. We shake hands with the "real" family in the front pews. And they stare back with resentment, or maybe with some old and tired gratitude, but mostly they stare through us. Yes. Chris Lighty made history. He helped make hip-hop. He was a success story. He was a sweet and brilliant man. But there will be no more knowing of him — the complexities, the simple s---, nothing. The man in the liner notes, the kid backstage, the dude counting the show money, the father with his children. It's beyond tragic. Everybody's Baby Chris is gone. Danyel Smith is the former editor of Billboard and Vibe.